or any other thing behind the camper. you can not see ! standing around and the comment was; " Looks like a 747 is landing ! ". 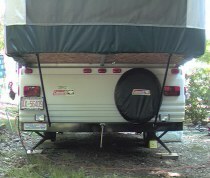 camper but may take more or less on other campers. I can use them any time I need any additional light. 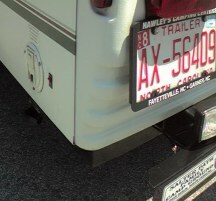 In this photo you can see that the lights are mounted on each side of the rear bumper slightly pointed to the outside of the camper. The lights are actually fog lights purchase from Wal-Mart for around $18.00. 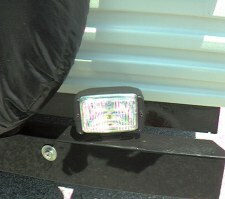 This is a close up view of the light mounted on the right hand side of the rear bumper on the camper. I usually do this to inspect the site.